The Wheel of Fortune is one of those cards were I prefer the DruidCraft interpretation over the Rider-Waite version. The Rider-Waite card draws its inspiration from a vision of the prophet Ezekiel who speaks of the four Living Creatures who had the face of a human, a lion, an ox, and an eagle. These four faces would eventually correspond to each of the four gospel writers in the New Testament. The wheel also comes from Ezekiel’s vision, but it also gets most of its symbolism from the work of Eliphas Levi, a French occult author and ceremonial magician. The symbols on the outer ring of the wheel include the four Hebrew letters that spell the name of the Divine Presence, YHWH. 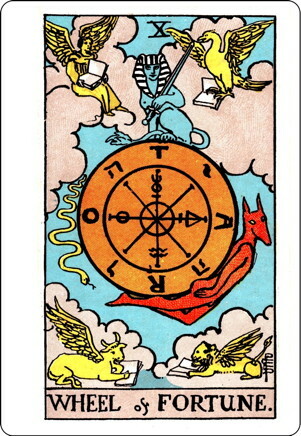 The four English letter can be interpreted three ways: T-A-R-O for “tarot,” T-O-R-A for “torah,” or R-O-T-A which is Latin for “wheel.” The last interpretation comes from the medieval concept of Rota Fortunae, the wheel of the goddess Fortuna. Therefore, this card is sometimes entitled “Fate,” depending upon the deck. Some commentators say the inner markings on the wheel are alchemical symbols for the four elements: Earth, Air, Fire and Water but I believe this is incorrect. As far as I can determine they represent salt, sulphur, mercury and water. Anyone have any additional insights on this? Personally, I think all this symbolism is overkill. It’s used to describe something that can be summed up in one sentence from Ecclesiastes 3:1, “For everything there is a season, and a time for every matter under heaven.” When the Wheel of Fortune card appears, I know it’s time to pay attention to patterns in my life and in the world around me. It’s time time to look at the bigger picture rather than getting bogged down in minute details. It’s also a time to name the “season” I am in (birth, growth, harvest, and rest) and align myself with its purpose in my life. This is why I find the DruidCraft version of the Wheel of Fortune so appealing. It’s simply called “The Wheel” which represents both the Sacred Circle and the Wheel of the Year. Its simple elegance is in sharp contrast to the frenzied symbolism of the Rider-Waite version. The DruidCraft Wheel invites us to let go of tension and worry, ground and center ourselves, and listen to what the Universe is trying to teach us at this given moment in our lives. Philip Carr-Comm sums up the meaning of this card as “You can see the patterns in your life and the wider patterns on the cycles of birth, life, death and rebirth. Harvesting the seeds of destiny, you continue to sow seeds of love.” Works for me! What more really need to be said? 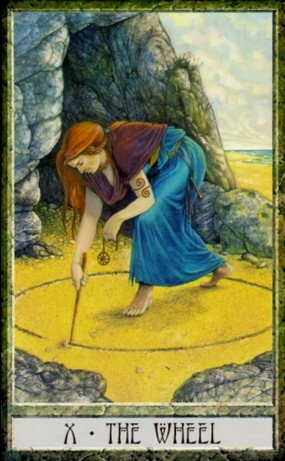 The Wheel of Fortune is a powerful card with deep and profound meaning. When this one appears in your readings, don’t rush over it too quickly. Give it the attention it deserves and you will be richly rewarded for the insights it provides. This entry was posted in Tarot and tagged Fate, Tarot, Wheel of Fortune. Bookmark the permalink.